Bulbmin (adults: ハチャッピー?, lit. : "Leaf Chappy"; juvenile: コッパチャッピー?) are a parasitic species of Pikmin found in Pikmin 2. These Pikmin infect Bulborbs and take control of them, but it is hinted by Olimar that they can take on other hosts as well. Physically, they resemble Red Bulborbs, except with a Pikmin stem and leaf (or bud or flower) atop their back. They can be found wandering the floors of certain caves and behave much like the Spotty Bulbear, patrolling an established path in search of food, and can be dealt with similarly by using sprays or Purple Pikmin. The cave with the greatest number of Bulbmin is the Submerged Castle. Mature Bulbmin, acting as a leader, can be followed by 10 or fewer juvenile Bulbmin. These wild juveniles can be used like normal Pikmin by the Hocotatian leaders, and each count towards the 100 Pikmin limit; exactly how many there are when entering the sublevel depends on the number of available Pikmin slots the player had prior, up to a limit of 10 juveniles per mature Bulbmin. The mature Bulbmin acts like a Bulborb, in that it will pursue and eat Olimar's Pikmin. After defeating it, the smaller ones go into a panic. 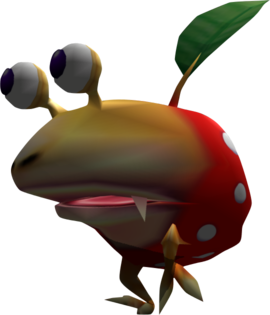 They are not dangerous, but whistling at them will instantly bring them into line under the leader's command, and they become part of his Pikmin swarm. This addition is not permanent though, as Bulbmin stay behind whenever the party leaves the cave. Besides appearing in a select few caves in story mode, they are also present in some Challenge Mode stages. As Pikmin that the player's leaders can use, the Bulbmin are identical to other Pikmin types, but look like Bulborbs and sound different. They have average capabilities in terms of mobility and strength, but are immune to all elemental hazards (fire, electricity, water, and poison). As beneficial as their abilities may seem, they cannot leave the caves with the group, for an unknown reason. Instead, they stay behind and watch the leaders and fellow Pikmin leave. Because of this, they will not count towards the overall Pikmin count, although any deaths do count towards the lost Pikmin total. Them being left behind when a cave is exited does not count as a death, however. This makes them ideal for use in Candypop Buds. There is no information regarding what Bulbmin inside Bulborbs actually look like. It is possible that they are green, since they appear as green dots on the radar, and since their leaves glow green when idle. Although they may also be orange, given the color of their stem, as well as the color of the conical aiming cursor when a Bulbmin is in hand, and the color of the trail they produce when thrown. That said, what is known is that their buds and flowers are white. The only way that Bulbmin can be killed before ever being whistled is if they are crushed, or they fall over the side of a level into the abyss when shaken by an enemy attack, explosion, or other sufficient force. To ensure a low Pikmin loss, if not zero, wait until it approaches the active leader, then throw Pikmin rapidly on top of the beast, further to the back than the front. If done correctly and with good aim, it should shake them off and turn around slowly: it has been distracted, leaving a large time gap in which to swarm it. Do it, then, and it should die before any of the Pikmin it manages to swallow do. Also if it is attacked by other Bulbmin it will hesitate slightly before attacking allowing more time to deal damage. As extra precautions or for an easier fight, use Purple Pikmin or an ultra-bitter spray if it captures any Pikmin. Approach the Bulbmin like a roaming Bulbear, attacking it from behind and avoiding its bite. Although its health is significantly lower than a Bulbear's, it can still take a substantial amount of time to kill without the Rocket Fist. The word "Bulbmin" is a combination of "Bulborb" and "Pikmin". In Japan, the mature Bulbmin is called ハチャッピー?, which means "Leaf Chappy"; "leaf" is because of the leaf (or bud or flower) coming out of their backs, and Chappy is the Japanese name for Bulborb. The juvenile Bulbmin is called コッパチャッピー?. Their scientific name is Parasiticus pikminicus, which is made up of Parasiticus, Latin for "parasitic", given that the Bulbmin itself is a parasitic life-form, and pikminicus, like "Pikmin". Internally, they are known as leafchappy, which is the translation of their Japanese name. French Bulbikmin From "Bulborb" and "Pikmin"
German Punktmin Dotmin; combination of Punktkäfer ("Dot Beetle", the Bulborbs' German name) and Pikmin. Italian Colmin Portmanteau of "Coleto" (Bulborb in the Italian adaptations) and "Pikmin"
Bulbmin in sublevel 3 of the Submerged Castle. A group of juvenile Bulbmin. A Purple Pikmin and a juvenile Bulbmin carrying an adult Bulbmin's corpse. A Red Pikmin and a juvenile Bulbmin destroying a fire geyser. The scene that plays when Bulbmin are discovered. Juvenile Bulbmin in a panic. How the carrying behavior of Bulbmin works in the field with the use of cheating devices. Bulbmin as they appear on the map screen. Artwork of a mature Bulbmin. Artwork of a juvenile Bulbmin. Artwork of a Bulbmin and a Red Pikmin. The creature's e-card, #12 (13th red card). A close-up screenshot of a juvenile Bulbmin. The three stages of Bulbmin sprouts in the ground. The only place where Bulbmin can be buried – and hence, the only place where one can observe Bulbmin with buds – is the Frontier Cavern, on sublevels 4 and 5. Swooping Snitchbugs can plant them in the ground on sublevel 4, and they can be planted by Mamutas on sublevel 5. If the game is altered such that it allows Bulbmin on the surface, they will take refuge in the ship's storage when the day ends, just like Purple Pikmin and White Pikmin. They will still count towards Olimar's Pikmin count, but they cannot be taken out of the ship the next morning. Although immune to poison, the adult Bulbmin will take a fair amount of damage if having eaten a White Pikmin. Bulbmin can actually be found in the game files of Pikmin 3, despite them being absent in-game. Because of their model being identical to the one in Pikmin 2 , it can be assumed that the idea of them returning was scrapped early in development. Strangely, it seems that the only Bulborb that the Bulbmin tends to take hostage is the Red Bulborb, even when it would make more sense to take control of a Hairy Bulborb on cold caves. 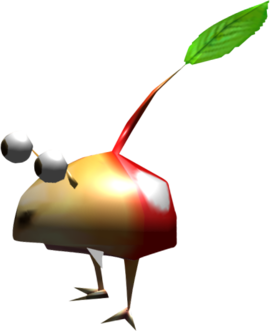 Bulbmin are the only Pikmin that were created before Super Smash Bros. Brawl and do not appear in that game in any way, or in any other subsequent Smash title. A Bulbmin appears on the New Play Control! Pikmin 2 Channel Screen. Strangely enough, the young Bulbmin do not die when caught in an explosion while under the control of the mature Bulbmin. However, when under the player's control, they can die by explosions. This is more of a useful tip, since the mature Bulbmin can die from it, and the young will remain fine. When juvenile Bulbmin perish, their spirits appear as any other enemies' spirits, not as Pikmin spirits. This may likely be due to how the Bulbmin find a bulborb host, in which the host ends up losing its life, as well. Bulbmin, along with Yellow Pikmin, Winged Pikmin, and Rock Pikmin make different noises than other Pikmin. They, along with Breadbugs, can be cannibalistic, as the adult Bulbmin will eat juvenile Bulbmin following a leader. Via hacking, Bulbmin can be placed outside of a cave and onto the field. Their carrying behavior is the same as their Purple and White relatives; they will take a fallen foe/Pellet into a Onion chosen at random since Bulbmin have no Onion of their own and will tote any other objects, like berries, to their correct location. It also is irrelevant if they are outside, Bulbmin are still immune to all hazards. The Pikmin appear to be orange, as hinted by the picture above. As of Pikmin 3, no parasitic Pikmin has been seen on its own. This article was a featured article from December 3rd to January 26th, 2009. This page was last edited on February 6, 2019, at 17:03.